There's nothing quite as distinguished looking as a man in a Stetson hat. In GriggsDakota that has always been true. When I was young, a Stetson hat was a particular soft gray color and shape. Western to be sure, but not a cowboy hat. Like a fedora with a wider brim. It was a gentleman's hat, a cattleman's hat, Grandpa's hat, Dad's hat. I've discovered it is hard to find old photos of men in their Stetsons. Good manners ruled that that the hat was removed as the wearer stepped indoors, or in the presence of a woman. Unless, I suppose, she particularly wanted a photo of her man in his Stetson. 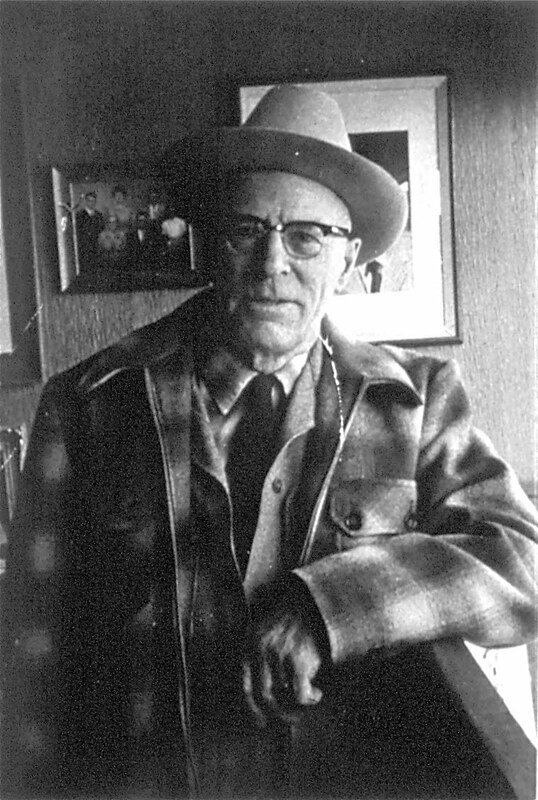 Here is Farmer Fred's grandfather, Fred Port in his Stetson. My dad's best friend married his sister. Uncle Dan wore a Stetson to work in cities all over the country. I remember walking with Uncle Dan down the sidewalks of Michigan Avenue in downtown Chicago. He was a successful businessman. He was in his Stetson, dark suit and dress coat. My aunt and I were in our best winter outfits and coats. He took us out to lunch and I have never forgotten the joy of that day. Dan's Stetson hat had connected me and my world to this world of dark suits. I believed that I could belong there. After I grew up, I learned that a seed company gave farmers a Stetson hat as a premium for buying seed. That explained my Dad's Stetson and the hats I saw while I was growing up. These hats last a long time or perhaps forever. There are specialty cleaners that carefully clean and restore well worn hats. 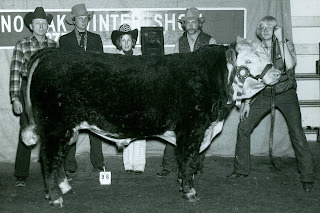 Stetsons are truly a long term investment. A few years later, and many years ago, I had a chance to visit the Stetson Hat Factory in St. Joseph, Missouri. It was that day that I learned Stetson made all kinds and colors of beautiful western hats. Nearly any beautiful cowboy hat I had ever seen could have been a Stetson Hat. They had a factory outlet store in a little corner of the plant. We arrived shortly after eight in the morning. The store was just opening and we were the only customers. I asked if a tour of the plant could be arranged. The gentleman in charge told me no. OSHA would not allow tours anymore. Too much risk involved. I was disappointed and I guess it showed on my face, because the gentleman began to tell me about the operation and let me peek back into the factory where I could see thousands of Stetson boxes. He showed me the beautiful satin lining in the hats. He explained the X's on the inner hat band. These indicate the amount of beaver fur used in the felt. The more X's, the more fur and the higher quality of the hat. I learned that a five X is a good hat, ten X is a luxury item and a twenty X was the best that Stetson made. We bought hats that day and returned to the store a couple more times over the years to buy more hats. The same friendly Missouri gentleman was there every time we came. He gave me a John B. Stetson hat pin with the JBS brand on it and a little card that said "Like hell it's yours. Put it back, it's a Stetson." It had a place to put an address and phone number in case the owner and hat were ever separated. The card fit into the inner hat band. It is meant to deter thieves and I believe it does. We still have our hats. American made Stetson hats are less popular than they once were. Stetson closed the original plant in Philadelphia in 1971 and the St. Joseph, Missouri plant in 2004. My research tells me that there is still an outlet store in St. Joe, but the factory is now in Garland, Texas. If you are interested in the history of the company Click Here for a link where you can learn more. The hat may not make the man, but he will certainly look more distinguished in a Stetson. I really need to go to that store, because I live in St. Joe! I wish I could have a tour too. I love the old pictures, especially the one of the "belt buckle" steer. Growing up in northwestern Minnesota, I didn't see too many men wearing a Stetson. However, my Grandpa Regimbal always wore one. He was a cattle rancher, which was not too common in the Red River Valley. His hatband had the same inscription about "The hell it's yours. . ." At age 10, I found that to be one of my Grandpa's most endearing traits. He was comfortable in his unique headwear, and I was amused with the "secret" inside the band. I remember sneaking a peek whenever the hat was within reach. But that wasn't often!